Emergency crews have to respond to multiple problems. The extreme cold weather is now putting a big stress on water pipes which are bursting after freezing or being stressed by the severe temperature swings. On Friday February 1st, emergency crews had to respond to three water incidents related to the weather. The first happened at the Buffalo Center for Rehabilitation and Nursing on Delaware Avenue in Buffalo. 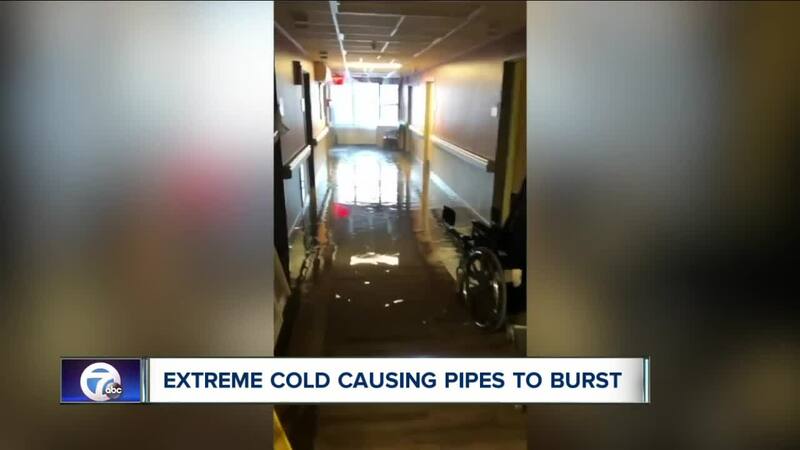 Frigid temperatures caused an interior sprinkler pipe to burst and pour water down through one of the facility's wings. The next incident happened in the Bio-Medical Education building at the U.B. South campus. Cold temperatures triggered a leak and water-flow alarm in a stairwell fire hose pipe. Another problem happened in Downtown Buffalo in the late morning. A service connection to a fire hydrant located at Ellicott and West Mohawk burst sending large amounts to water into the surrounding streets. There was no impact on customers but it left behind an icy mess for cars and pedestrians. Another concern with the deep freeze are water pipes in crawl spaces under homes. Officials warn to not use torches to thaw the pipes. Instead, it is recommended to prevent the freeze-up in the first place by keeping water taps open a tiny bit so the water can continue to trickle out. 7 Eyewitness News Reporter Ed Reilly has more in his attached report.